Newcomers, you can read my MPM intro here which tells you all about who we are and what we eat, or just visit my super-duper-list-tastic itemization of Everything We Eat (as well as the rest of this blog, of course). We ate so well last week! Wow! This week, I want to make a double batch of no-knead bread dough so that I will have two nice artisan boules to take to our two (!) bris hosts on Wednesday. Also, with temps in the high 30’s all week, these are easy suppers, with NO SOUP on the menu! And hopefully at least one BBQ. Monday: No-knead bread, very basic pasta & sauce. Postscript: Yay, we had a power failure but thanks to menu planning, the show went on with grace and aplomb. Well, we had to use the downstairs (gas) oven for the bread, and the thermostat is wonky so it burnt and set off the (battery-operated) smoke detector. But still – yummy! Tuesday (Ted’s off day): BBQ – what? Maybe homemade hamburgers, maybe steak. Nope, salmon! Ted did it all by himself because I was exhausted from seeing the Queen. Wednesday (Ted’s late day, 2 brisses): Pan-fried Salmon and couscous Nope, BBQ again! Hamburgers this time. Amazing, homemade ones! On amazing, homemade sprouted-wheat BUNS. Okay, I’m done. What a relief! 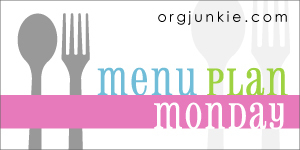 Michelle from Lionden Landing posted today how much she hates doing menu planning. Well, me, too. It is certainly a tedious way to start the week. So Mondays (or Sunday nights) are grim until it’s done. The trade-off is that it has made the other days of the week SO easy! So until further notice, Menu Planning on Monday it is.